PIKE CREEK, Del. 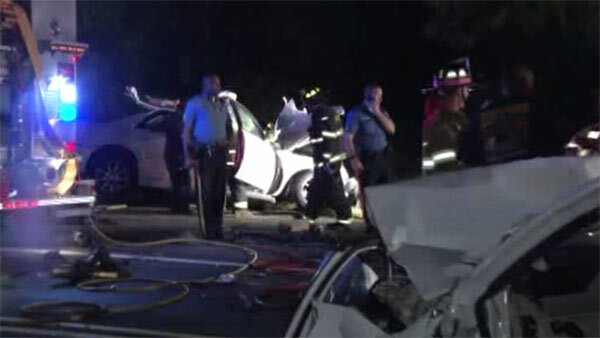 (WPVI) -- One person is dead and two others are injured after a head-on crash in Pike Creek, Delaware. The crash happened around 1:45 a.m. Sunday on the 4600 block of New Linden Hill Road. A Cadillac and Volkswagen collided head-on. Police say the Cadillac crossed a double yellow line and into the northbound lane of the road at an apparent high rate of speed. The driver, 27-year-old Michael Bellafore was not restrained and pronounced dead at the scene. Police say alcohol played a part in the crash. A passenger in the front seat was seriously injured. She was not restrained at the time of the crash, police say. She was taken to Christiana Hospital in critical condition. The 16-year-old driver in the Volkswagen suffered non-life threatening injuries. She was also taken to Christiana Hospital. The road was closed for more than five hours while police investigated and cleared the scene.